13th July 1931 was doubtless inaugural day of mass agitation of JK [Muslims] for freedom from subjugation & oppression by foreign rulers; the duty stressed upon by that martyr in his ‘dying declaration’. The agitation was in sooth a socio-political awareness campaign that had originated from, & was, accordingly, gathering direction, shape & strength from the efforts of Reading Room Party & Jammu Young Men’s Muslim Association. Understood from the realistic prism, the movement was undoubtedly & predominantly for the basic human rights of the [Muslims] of JK, for simple reason of that they were overwhelmingly the sufferers & victims of tyranny, injustice, discrimination & arbitrariness at the hands of the despotic rulers since centuries. The starters, carriers, sufferers, campaigners, victims & martyrs of this socio-political agitation were, overtly and covertly, the Muslims of JK only. The sloganeering, speeches, podiums-banners used, were all Muslim. Above all, sacrifices & blood were Muslim. If local non-Muslim [pandits] had been a part of this democratic agitation for rights, then, they too would have fallen to the bullets of the Dogra sepoys together with their Muslim brethren. They too would have been jailed with their fellow Muslims. Even, during imposition of martial law like situation, after 13th July, 1931, which also let loose a reign of terror in Srinagar when Pandits in collaboration with cavalry men of Dogra kingdom got hundreds of Muslim protesters arrested, their houses ransacked & their females molested. It left scores of Muslims dead by the despot’s forces, (Ibid, 382), but nowhere non-Muslims were seen as the victims of the State cruelties. If Pandits had been having at least human understanding of, & empathy with their fellow Muslims on, their killings & sufferings, then, they would not have sided with the oppressor nor launched a counter Roti/ Bread Agitation against the Glancy Commission of 1931-1932 that was appointed by the Hari Singh’s Administration following 13th July massacre to look into the serious grievances of the Muslim subjects, and its simple acknowledgement of the need for satisfying certain demands of the Muslims. It needs a mention here that besides two Muslims nominees, P N Bazaz, a local Pandit & one, Lok Nath Sharma, from Jammu were nominated as members to assist Glancy Commission in its assigned task. Ironically, for accepting this nominee-role in Glancy Commission, P N Bazaz became a total outcast from his Pandit community. In April 1932, they, through their vigorous Bread Agitation asked the Maharaja not to implement Glancy Commission’s recommendations. Hundreds of Pandits courted arrest. Jialal Kilam, Kashyap Bandhu & other prominent Hindus, who later “made” friendship with SMA, supervised and guided the Bread Agitation. (Prof Mridu Rai, Hindu Rulers, Muslim Subjects (2004) pages 276-277) It is clear that Pandits were projecting the JK Muslims ‘agitation against the Dogra rulers’ denial of socio-religious-economic-political rights to them as if a fight between Muslims & non-Muslims, thereby communalising it. Nevertheless, the bitter truth is that there was not a faint smell of any communalism in this divine duty of raising voice against tyranny by the suffering majority. Nor had it anything to do with the western idea of secularism. It was a pure desi democratic and peaceful agitation by 85% suffering majority population against ills of monarchial rule of a minuscule number of people who had trampled upon their basic human rights. But, as it was initiated by Muslim majority against a Hindu king, the local Pandits wasted no time in twisting the facts on ground as they were known sectarian -supporters of the monarch since they held huge stake in the State administration & officialdom & never wanted the government to come in the hands of majority population, very essence of democracy. Apart from appointment of Glancy Commission, in the aftermath of 13th July massacre, the second most important development that took place was formation of the “All JK Muslim Conference” in October, 1932 with SMA as its first President unanimously chosen by all prominent Muslim leaders of that time from Jammu as well as Kashmir. It is noticeable here that in 1931 the Maharaja had given “his blessing to the foundation of three political parties … the Kashmiri Pandits Conference, the Hindu Sabha in Jammu, and the Sikhs’ Shiromani Khalsa Darbar…… political representation only for the non-Muslim groups. As a consequence, the overwhelming majority of the population remained without any organised political party”. (Ibid, Danger in Kashmir) Following Glancy recommendations, the first ever organised Muslim political party, All JK Muslim Conference/MC, was formed in 1932 that offered common platform to all Muslims of the State. SMA in his inaugural presidential address on 15th October, 1932 assured the minorities that “MC was not against them, their grievances will be addressed, while they must also respect Muslim rights”. He thanked All India Muslim Committee & Muslim Press of Punjab for their unflinching support in highlighting JK Muslim sufferings & guiding them for formation of a single political party for achievement of their rights. (CJ M Y Saraf’s Kashmiris Fight for Freedom (2009) Vol 1, pages 482-483) The headquarter of the MC was Pather Masjid, Srinagar where a permanent platform & a building, commonly called Mujahid Manzil, in the lawns adjacent to it, with the contribution of party members, were raised for taking the movement, written by the martyrs of 13th July with their blood, to its logical end . 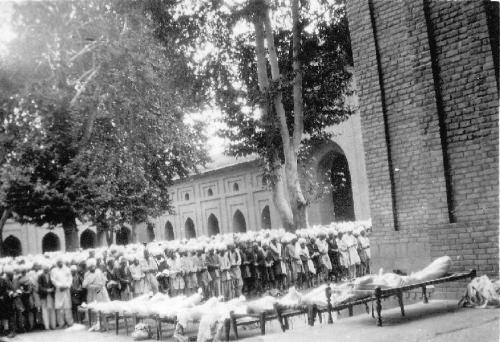 The direct result of succumbing to these pressures ultimately culminated in burial of the MC when at 1.45 pm night of 11-12 June 1939 it was formally converted into NC at Mujahid Manzil Srinagar. The decision that had united Muslims of JK under the banner of MC was reversed by SMA himself. Immediately, the MC’s green flag with white crescent in the middle was pulled down & replaced by a red flag with a plough in the middle which, thenceforth, became the party flag of the NC which was prepared by Pandit Prem Nath Dwarika & designed by Sardar Budh Singh & which apparently corresponds to communist flag with same red background with scythe instead of plough in the middle. On the day of transformation of MC into NC, there was, quite expectedly, huge jubilation among local Pandits who celebrated it as their great achievement. But many a Muslim within NC even were unhappy with SMA’s move. A handful of non-Muslims who had joined NC in their personal capacities wore “secular robes” but deep inside they continued to be communalists well connected with INC & not NC. They had joined it just to fool SMA & his followers. It was Nehru’s great endeavors that had persuaded these few local Pandits towards SMA. But they always doubted him. They were affiliated by heart to INC. (Hamdard, dated 10-06-1947; KR dated 16-03-18) It comes out to have been a web that was woven around him by Nehru over a period of time directly (Ref three meeting of SMA with Nehru in January 1938 in KPK; Freedom Movement in Kashmir (2009) by GH Khan, page 347) & through his men at home who were called “liberal-secular-intellectuals”. Pathetically, SMA, on the one hand, admits (in his biography even) that the MC was not communal organisation working against interests of non Muslims but, in the same breath, few years after MC launch, he allowed himself to come under the pressures of Pandits when he started thinking of “broadening the party base” by changing its nomenclature, constitution & name even. It was not rechristening, as some call it, it was a total reversal of socio-political-religious thought on which JK Muslims had initiated their struggle of rights. Time & again, non Muslims were invited by the MC, through him also, to come & join it. But they always expressed apprehension that by joining majority MC the Maharaja would lose power & they would be finally subdued by the majority Muslim community. In a sense, they wanted overwhelming majority to remain under the thumb of minority hegemony through Hindu rulers. Earlier on 1st April, 1939, Jinnah, in his reply to an address presented by Kashmiri students at the AMU, declaimed: “I can say with certainty that SMA is in the wrong. Having got himself ensnared by the Congress which is thoroughly a Hindu organisation, he has put the ship of his community in a whirlpool. ….he is doing this out of ignorance ….he will soon realise his mistake …….will come to know that those whom he is considering his friends and at whose beck and call he is acting , are not his friends but his enemies…..” (Statesman, April 16, 1939 also cited in G H Khan’s Freedom Movement (1980, rept 2009) pages 372-373; the book contains SMA’s approval by Foreword) Josef Korbel summarises good & bad two decisions of SMA’s making & breaking MC, or first unifying & then splitting JK Muslim unity, in these words: “As a matter of fact, the origins of the present tragic struggle can…. be traced back to those months (of 1939 of changing MC to NC). Up to that time the Muslims had been united through the MC. In 1939 this unity was broken. Responsible for this tragic schism was none other than the popular Lion of Kashmir, SMA”. (Korbel page 16) It was certainly a “political fault line” that enabled India openly interfere in JK affairs & empowered a single person, the Ruler, “to decide on his own the future for all his subjects”. (Alastar Lamb, Birth of a Tragedy, page 13). M J Aslam is Author, academician, story-teller, freelance columnist & presently AVP, J & K Bank.